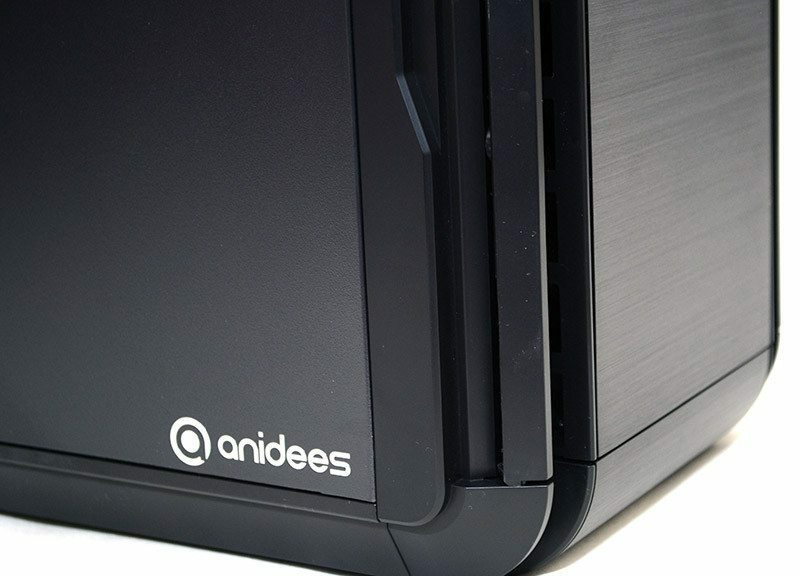 Today in the eTeknix office we have the brand new Anidees AI-06 V2 mid-tower chassis, which offers up a big revision of their popular AI-06 model. 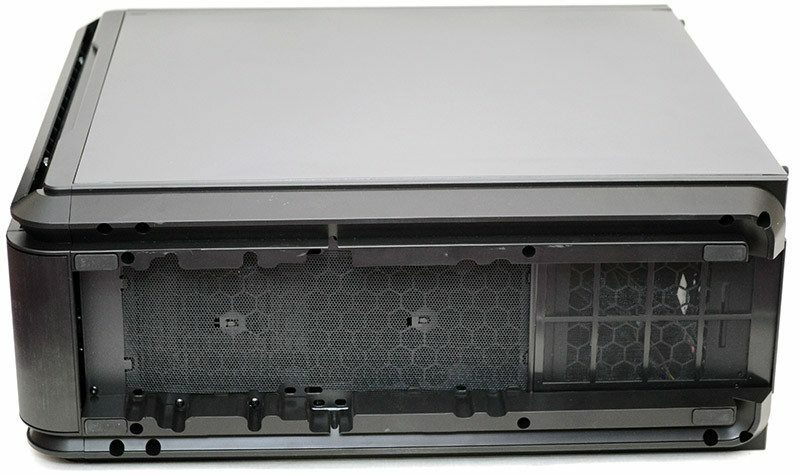 Taking an already robust chassis, adding in more flexible storage solutions, a card reader, improved cooling support, a larger side panel window (on the relevant model) and more. 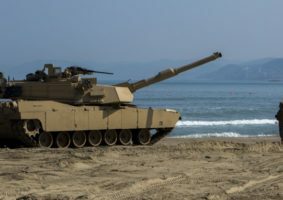 Today, we have the Silent equipped model, which comes fitted with sound dampening materials on the interior, although windowed and standard solid side panel without noise dampening materials edition are also available. 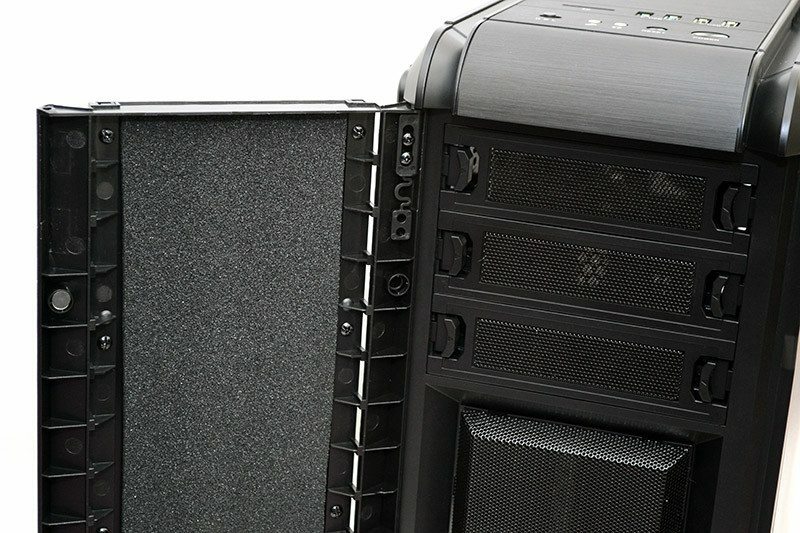 Equipped with an aluminium finished from panel door, multiple radiator and fan mounts in the front, top, back and bottom of the chassis, removable storage bays, an SD card reader and more, we’re really looking forward to taking a closer look at this chassis, so let’s get it out of the box and see what it has to offer. Rotate door with Aluminum line-finished for elegant look. Moveable front mesh design for ventilation and easy maintenance. 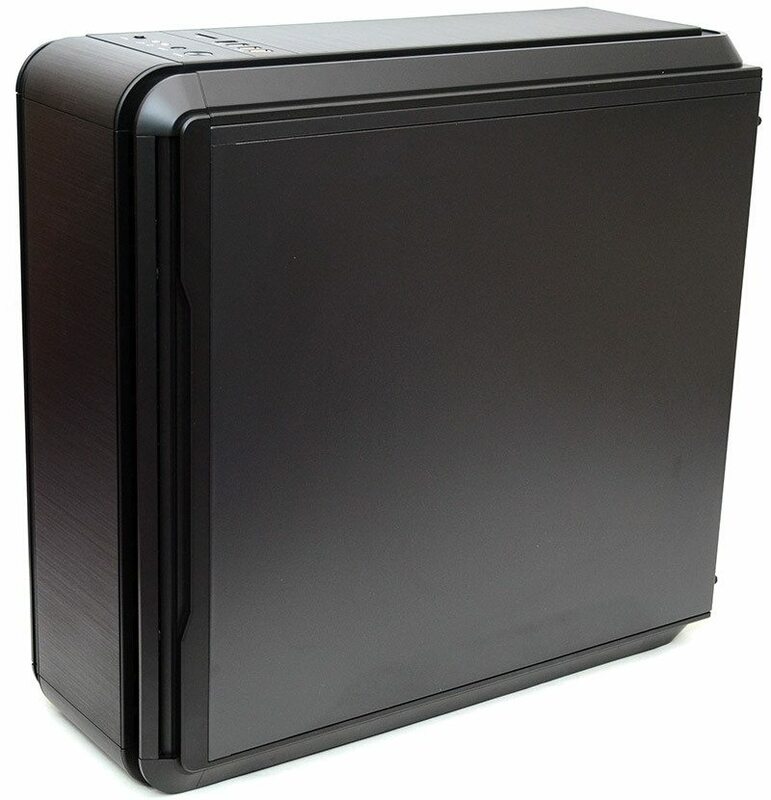 Accommodates 120 mm radiator in the rear, 120/140mm radiator in the bottom or 240 mm radiator on the top or front. Dust filters on the front and at the bottom. 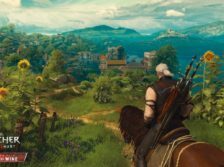 As you can see, the silent edition comes with a solid side panel on the left. 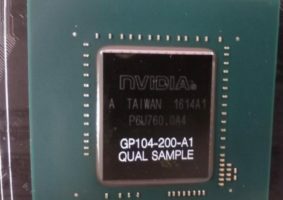 The panel is held in place by a pair of thumb screws at the back, nothing fancy, but a well-tried and tested design overall. 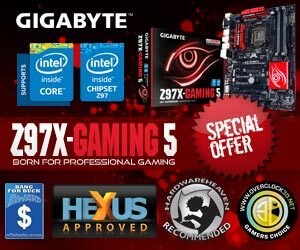 There’s some branding in the bottom corner here, it’s quite tastefully placed and this means the front panel can be left looking nice clean. Another heavy panel on the right, looking good in that lightly textured matte black paintwork. 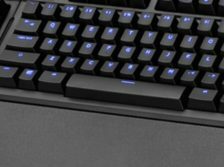 The front panel is really smart, finished with a good layer of brush textured aluminium, giving it a nice premium look and feel. 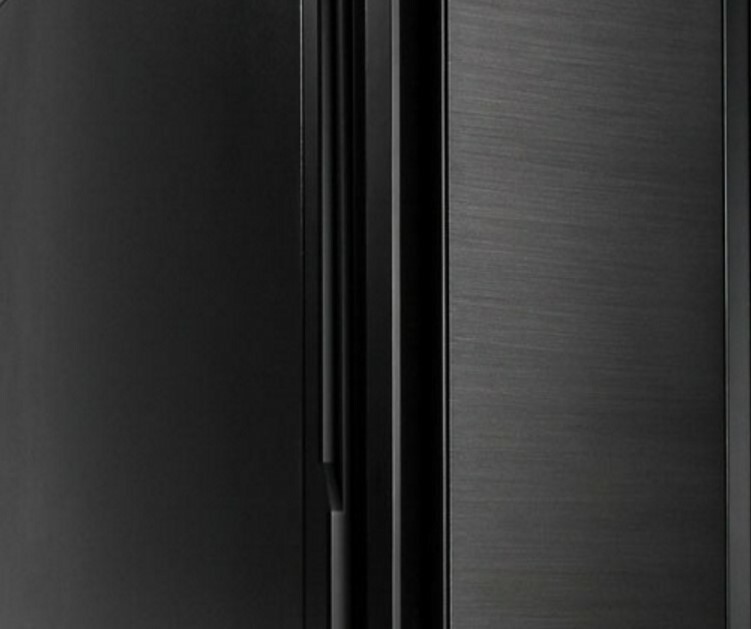 The door is held shut with magnets on the right side, allowing you to easily open it up to access the front panel component. In the door cavity, you’ll find a thick layer of noise-dampening materials, which should soak up a lot of unwanted noise from your systems cooling solution. 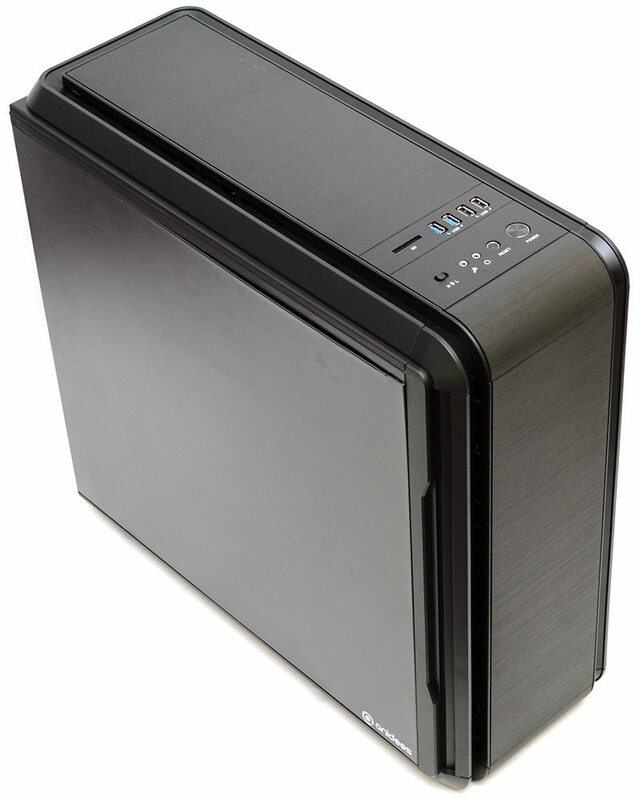 There are three 5.25″ drive bays on offer also, each with an easily removable lock-in cover. 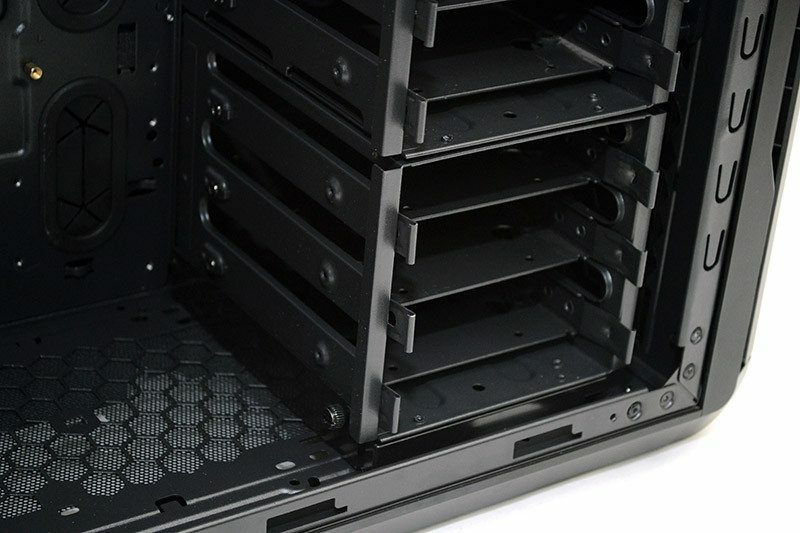 Further down, you’ll find a large ventilated panel for the front mounted cooling. 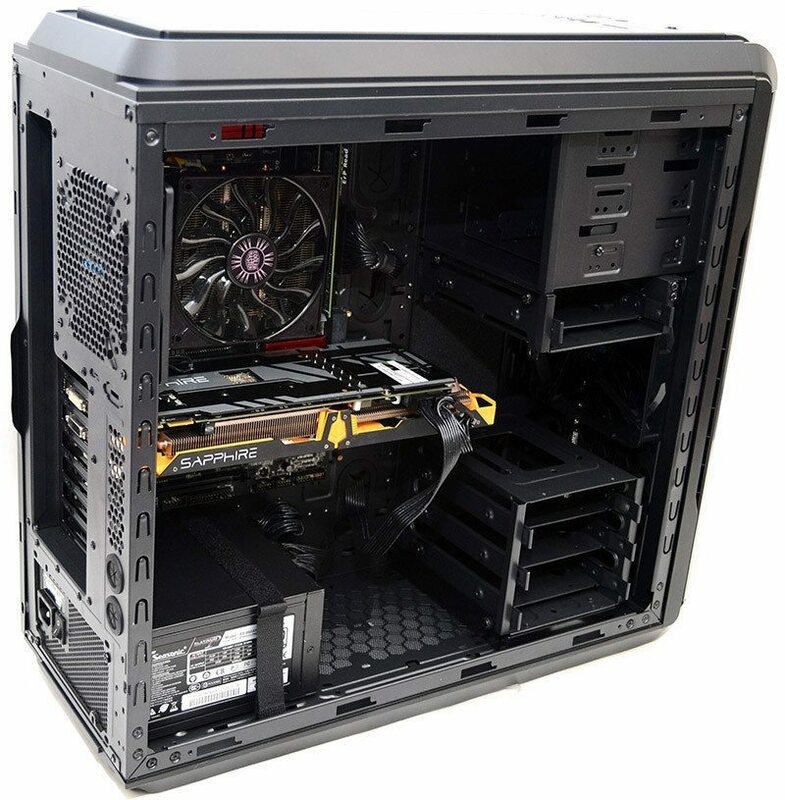 Around the back, you’ll find a 120mm fan mount, seven expansion slots, two water/cable routing grommets and the PSU cut-out; all pretty standard stuff, but that’s no bad thing. The covers are reusable and come with some ventilation to help with overall airflow. 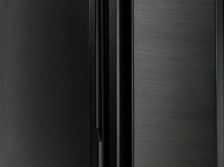 The top panel follows the design of the front of the chassis, curving at the edge to create a nice flowing design and featuring even more of that lovely brushed aluminium. 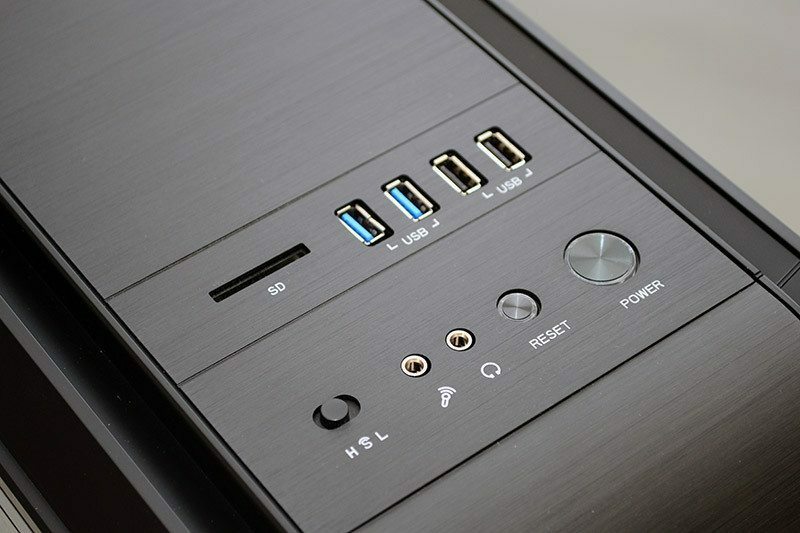 There’s a well equipped I/O panel towards the front, with SD card reader, four USB ports, HD audio jacks, and two nicely designed buttons for the power and reset. 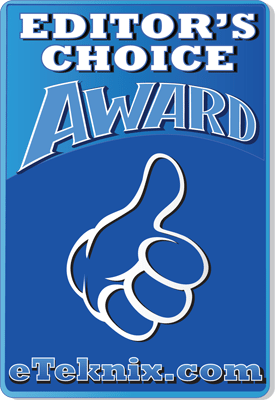 What’s also worthy of our attention is that there is a three-way switch, which functions as the built-in fan controller. 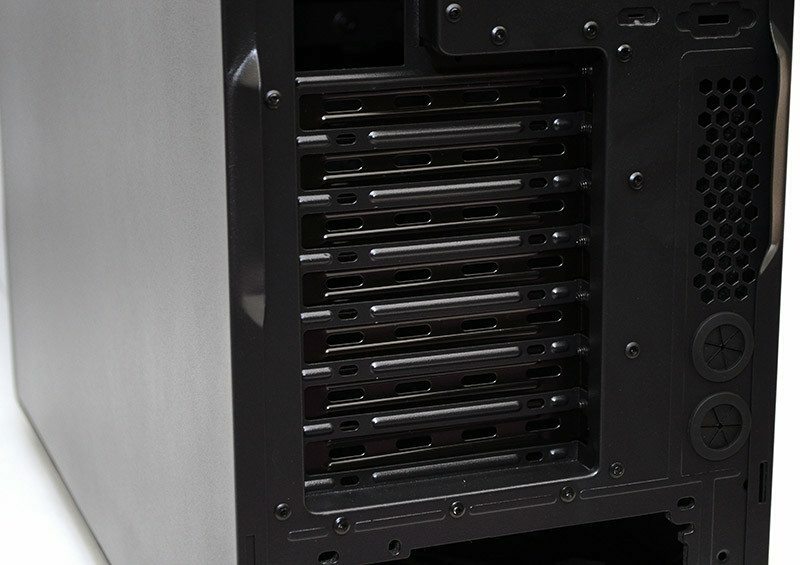 the base of the chassis features lots of ventilation for any base mounted cooling, as well as the PSU air intake. 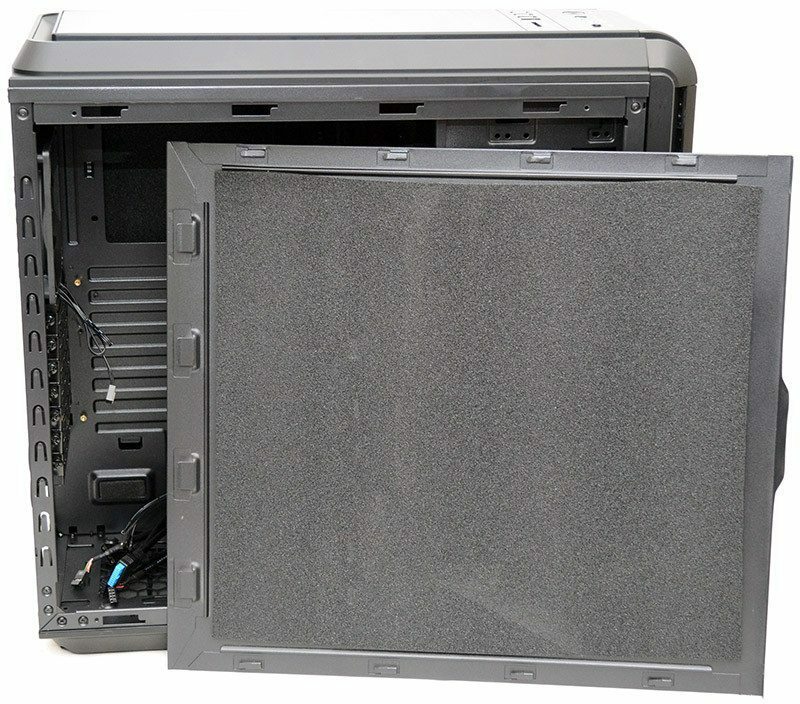 The PSU benefits from a slide out filter, but the remaining ventilation uses a simple clip-in mesh. 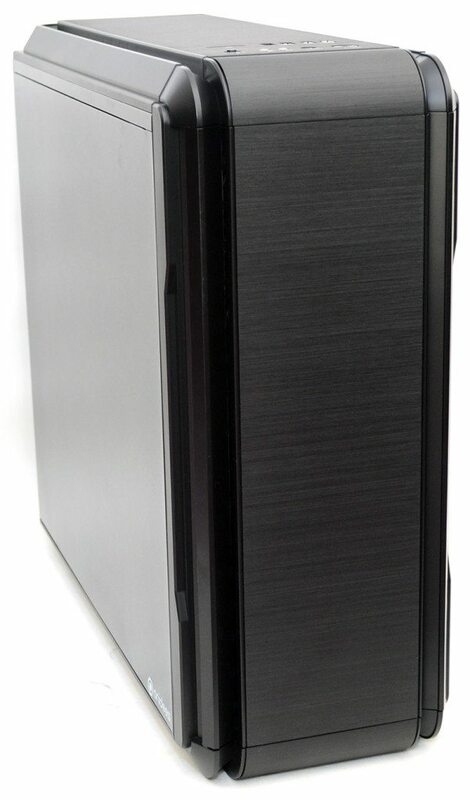 The left side panel is nice and thick, with a good weight to it, as well as a thick layer of noise-dampening materials, all of which will help soak up any unwanted noise and vibrations from within your system. 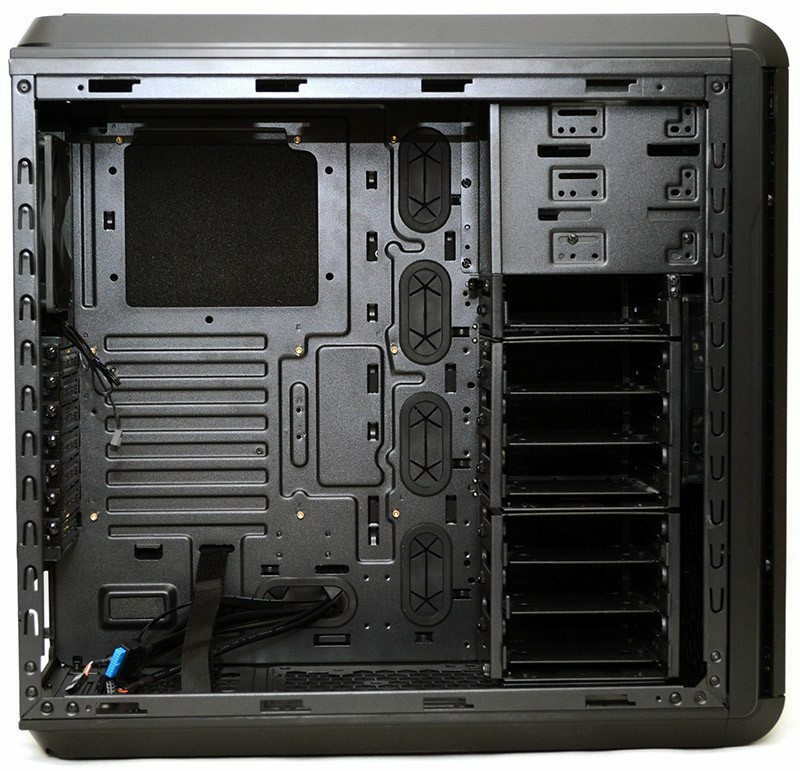 There’s a good amount of space within the chassis for your components, with a small CPU cooler mounting cut-out behind the motherboard, pre-installed motherboard standoffs, and five large rubber grommets for cable routing. 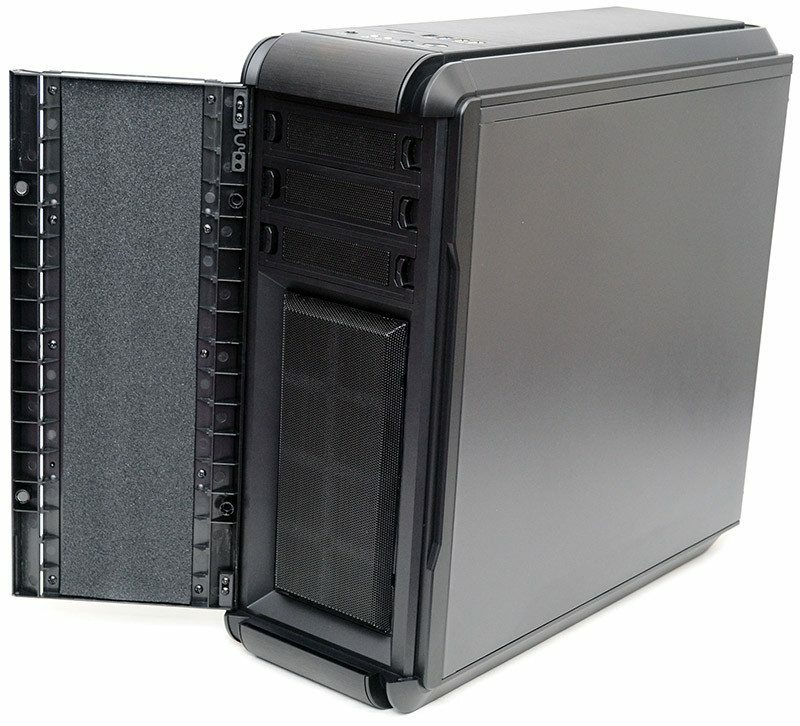 The three 5.25″ drive bays are fixed in place, but the bottom one also has a pre-installed adapter to support an additional 2.5″ hard drive. 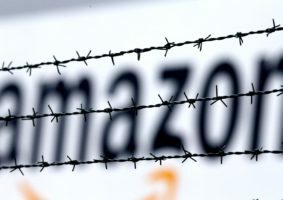 There are three main hard drive cages, a single 3.5″ at the top, 3 x 3.5″ below that. 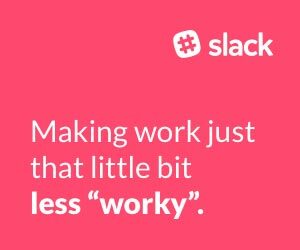 Another another 3 x 3.5″ below that. 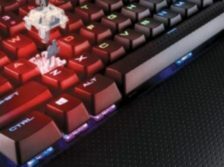 For 3.5″ drives, the trays are tool free, allowing for a quick and easy installation process, or you can use the included screws to mount 2.5″ drives in any of them. 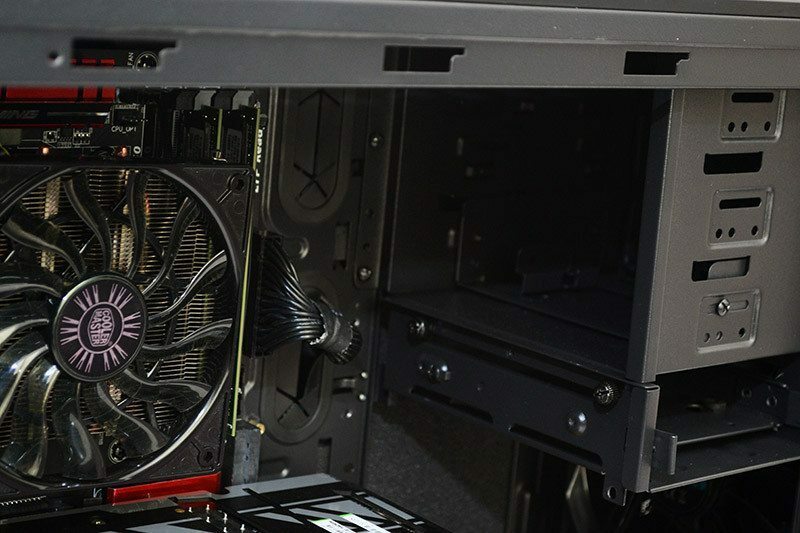 The PSU mounting area offers up a lot of space for high-end power supplies and there’s 120mm and 140mm fan spacing in the base for bottom mounted radiators or fans, just remember that you’ll likely need to remove the bottom hard drive bays to accommodate them. 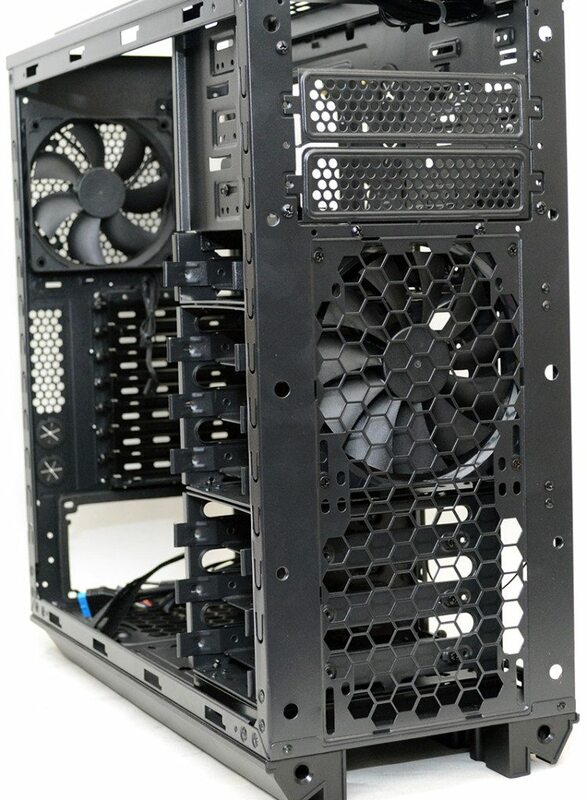 In the rear of the chassis, there is a single 120mm fan pre-installed, which comes equipped with a black 4-pin PWM cable. 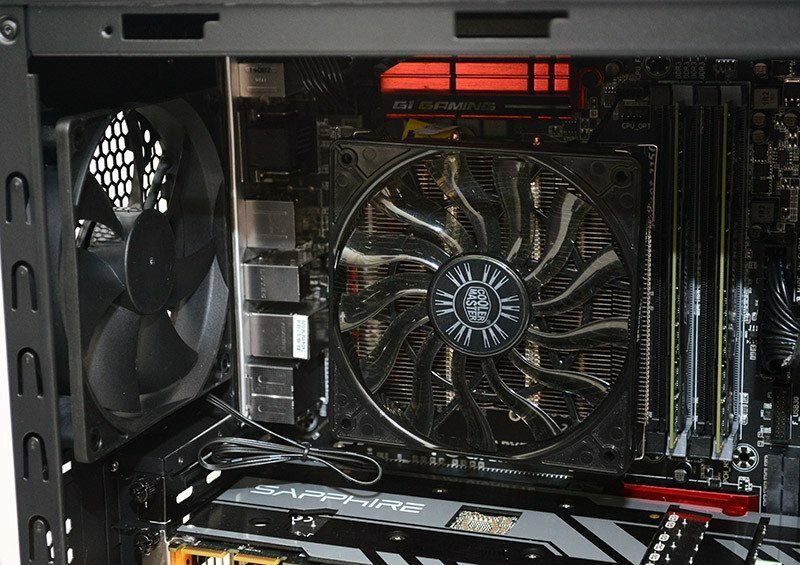 There’s a good amount of clearance above and below the fan mount too, so custom or AIO water coolers should fit easily enough. 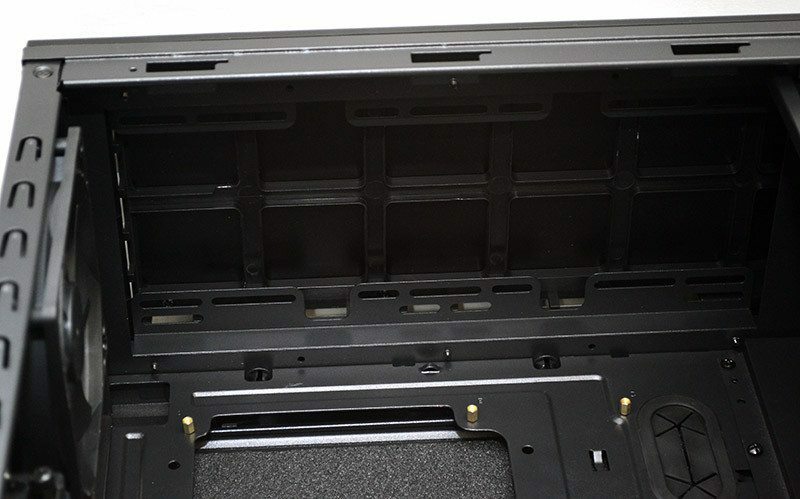 Each of the expansion slots comes fitted with a reusable cover, and all are fitted with thumbscrews for easy access. 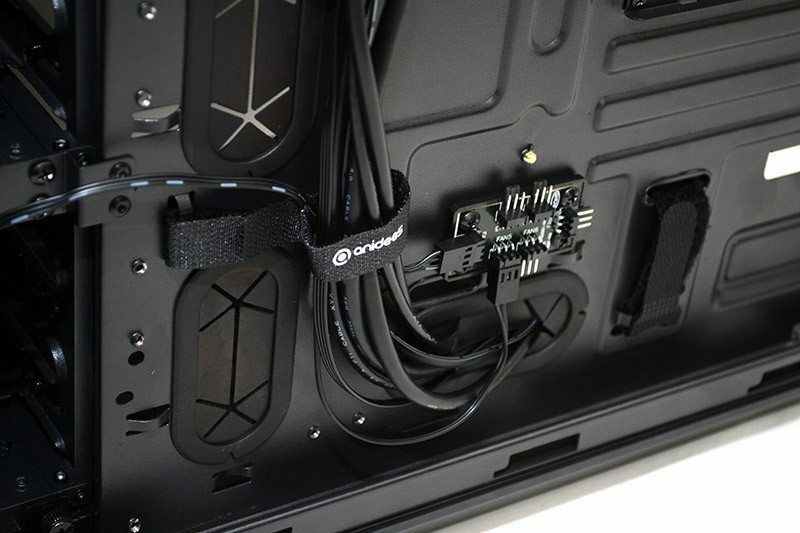 The PSU mounting area features a thick Velcro strap to help ensure a secure fit on the four anti-vibration pegs, and there’s also a foam padding around the cut-out to allow a clean and vibration free fit. 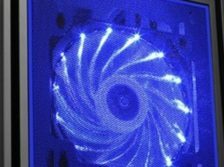 Even more cooling options in the top of the chassis, with 120mm and 140mm fan spacings, as well as ample clearance from the top of the motherboard for thin radiators and fans. 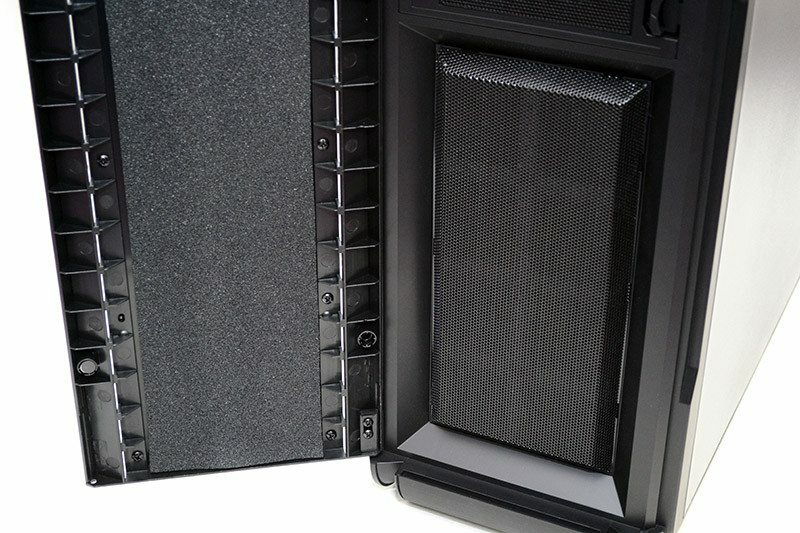 Around the back, you’ll find the right side panel also has a thick layer of sound dampening material, which does eat up a little cable routing space, but there’s still a good amount of room regardless. 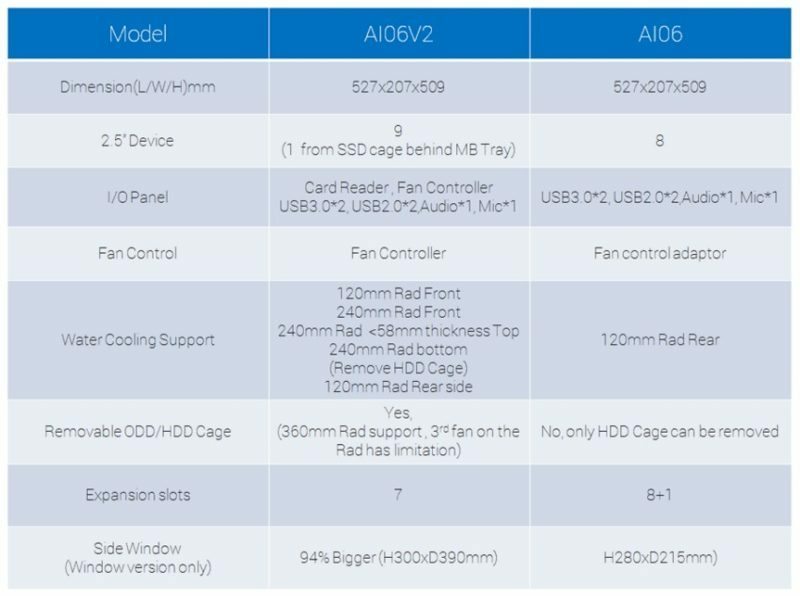 The first thing that leaps out is the small fan hub at the bottom. 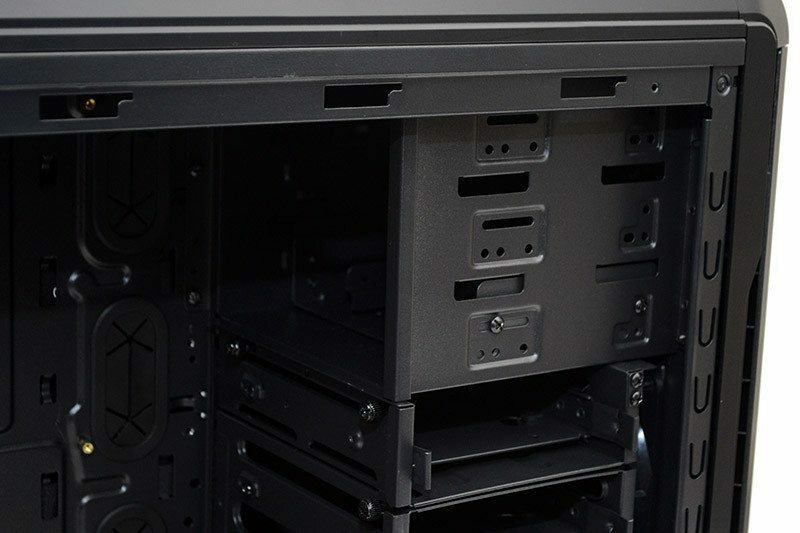 There’s room on here to connect all the fans the chassis can handle and their speed can then be controlled using the three-way switch on the front panel. 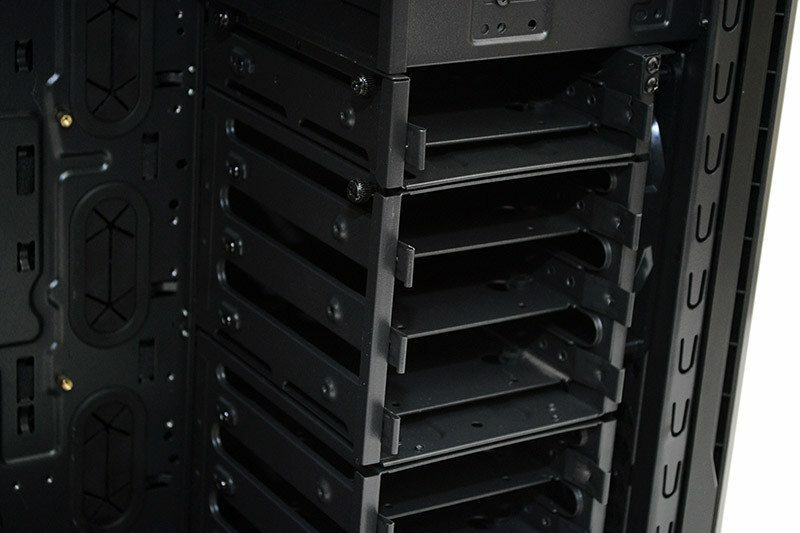 The three main hard drive bays are removable, but it does require a little tool work. There are a few thumb screws on the other side, as well as some here at the bottom. 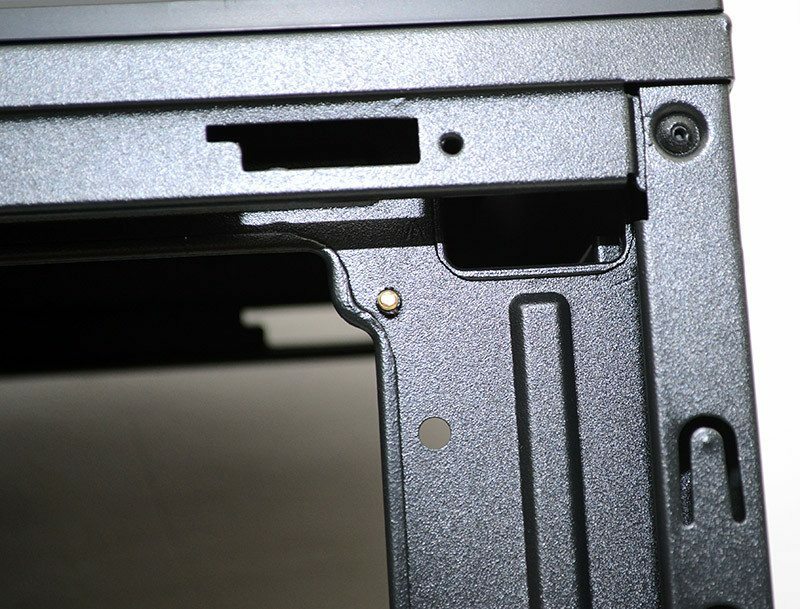 Metal strips run along the joints between each bay and a few standard screws have to be removed to slide the bay out. 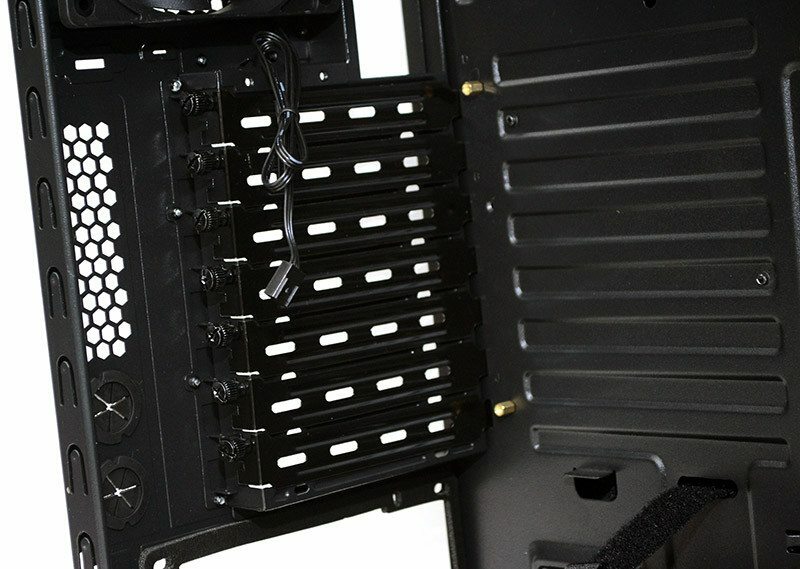 Fully fitted with thumbscrews would be more practical, but at least the bays are held in nice and secure overall. 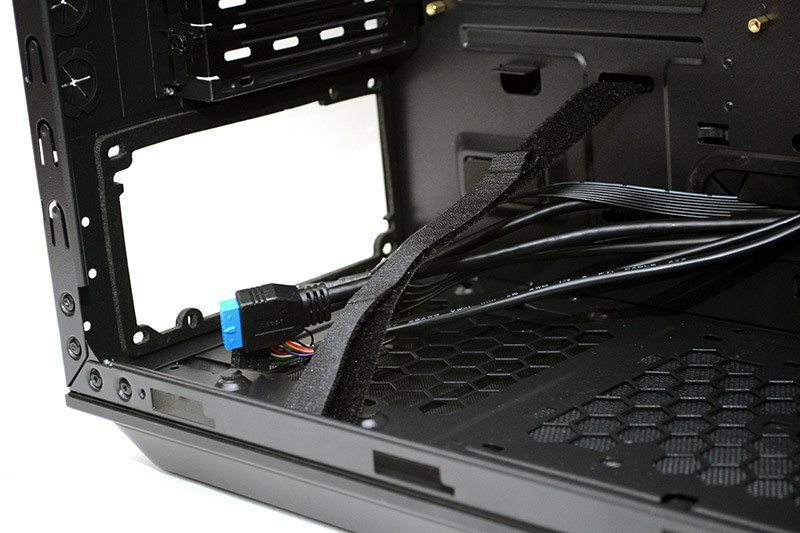 Cable routing is made easier by multiple velcro cable tidies alongside the rubber grommets, however, you’ll also find basic metal loops to run cable ties through as well should you need them. 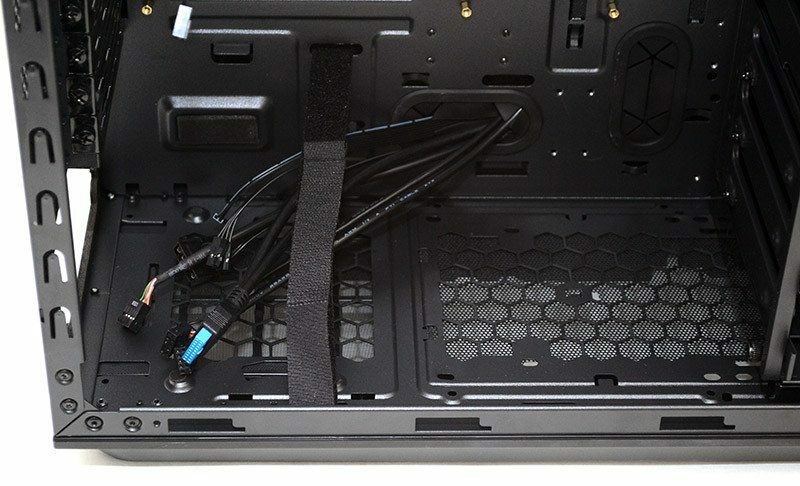 A small cable routing hole in the top corner for the motherboard 4+4 pin power cables. 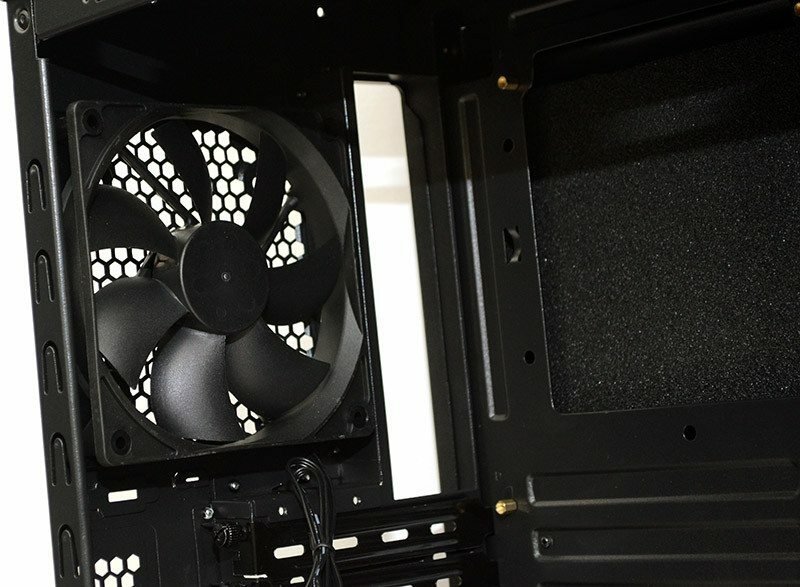 The front panel can be pulled away without the use of tools, and here you will find a pre-installed 140mm intake fan, and plenty of room for another should you need it. 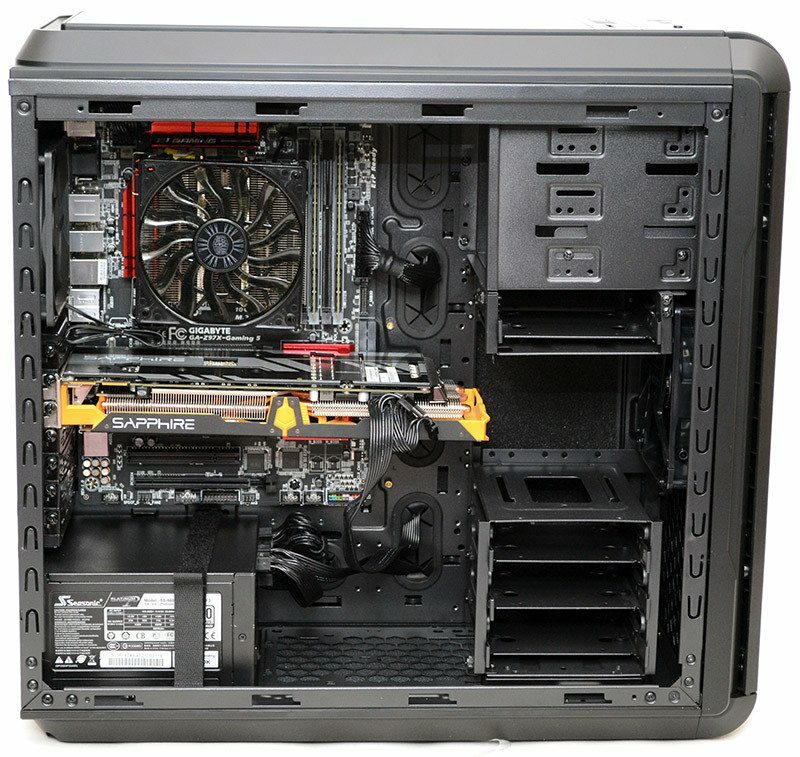 Of course, you could completely pull out those hard drive bays and get a thick radiator in here also if you needed it. 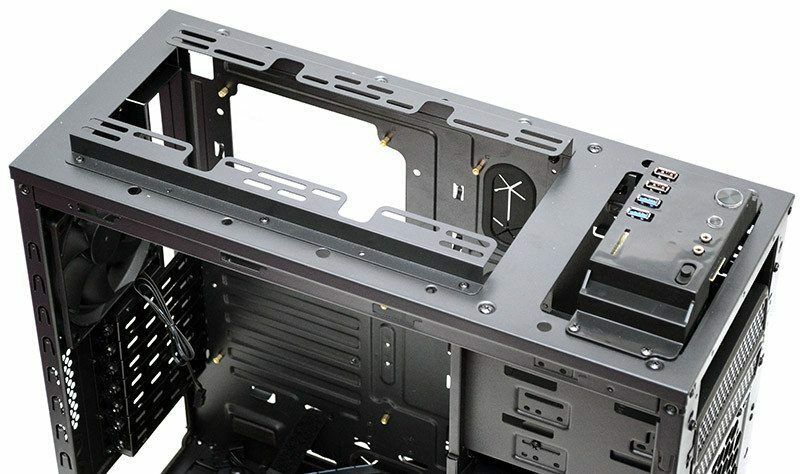 The top panel is a little trickier to remove, as you need to take off the front panel and remove two screws, but once done, you have much better access to the plentiful fan/radiator mounting solutions on the top section of the chassis. 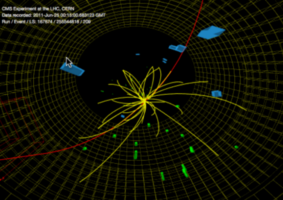 The total built time on this system was around 25 minutes, which is fairly modest given the end result. 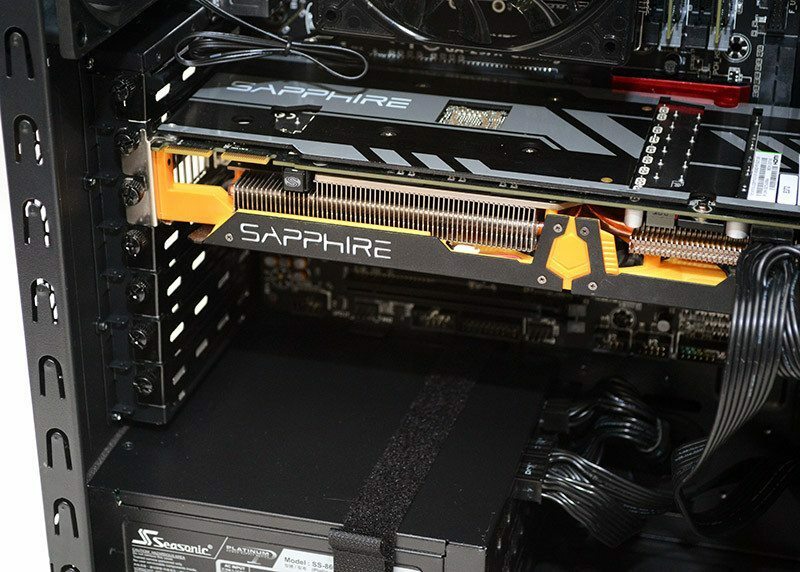 I did have to remove the front hard drive bays or at least a section of them as the Sapphire R9 270X was 5mm t00 long to be installed. Of course, the GPU we have used is quite large, so it’s unlikely most people will have this issue, but even with it removed we still have one upper and three lower 3.5″ bays at our disposal. 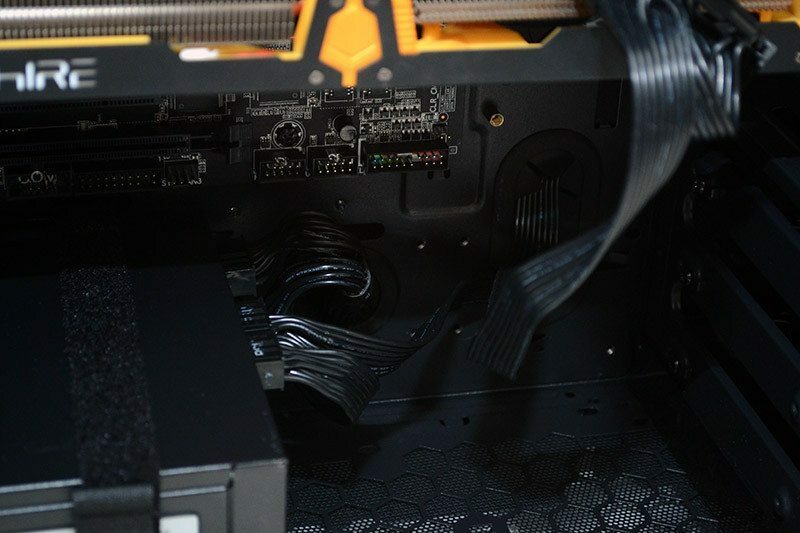 Cable routing is looking neat and tidy, but for some reason, the two cable routing holes here are much smaller than they look and it was a little tricky passing PSU cables through them, so larger cutouts on future models please Anidees! 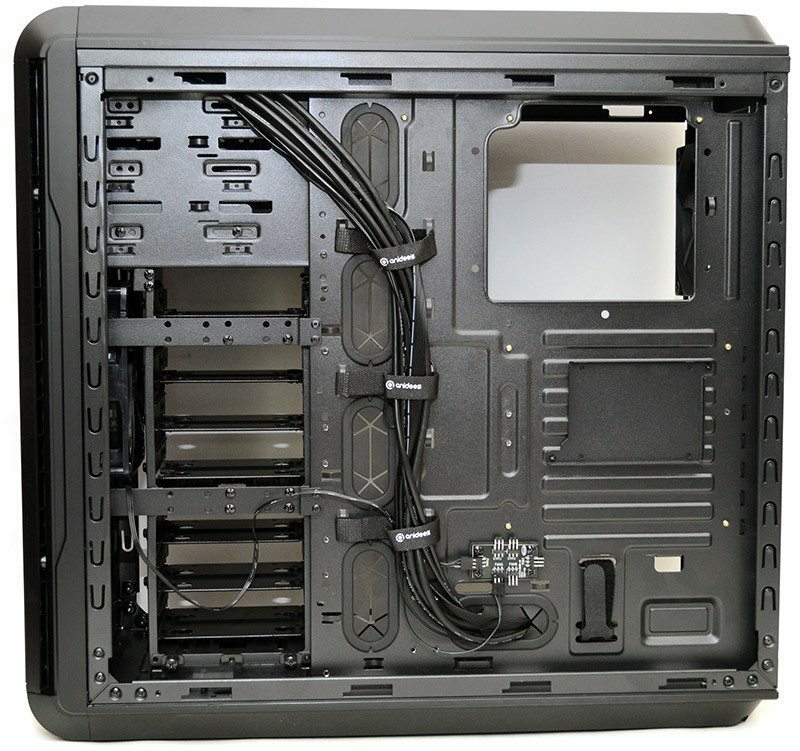 Again, neat and tidy cable routing here with the grommets being in a good position for the motherboard ports. 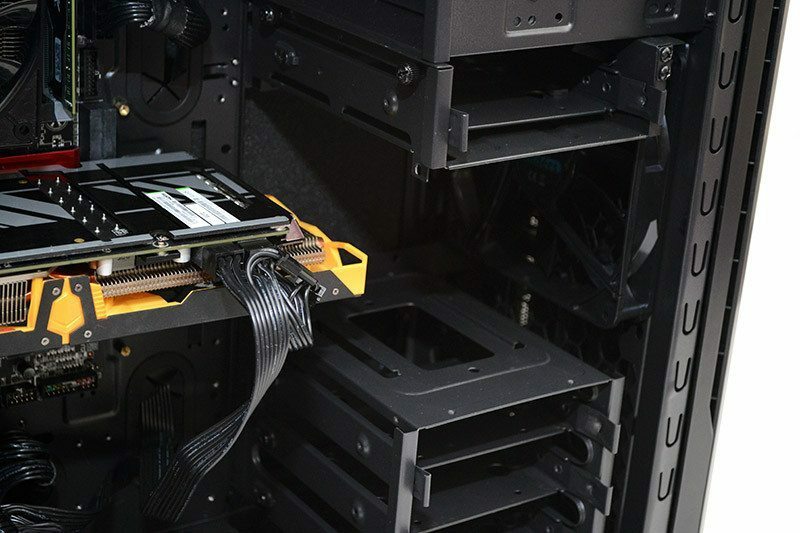 One benefit of the removed hard drive bays is that the front mounted cooling is more direct to the back of the GPU; it won’t make a huge difference, but it certainly won’t hurt cooling either. 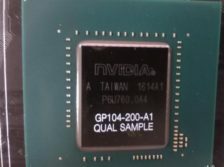 More than enough room here for multiple expansion cards and even wider expansion cards will prove no issue. 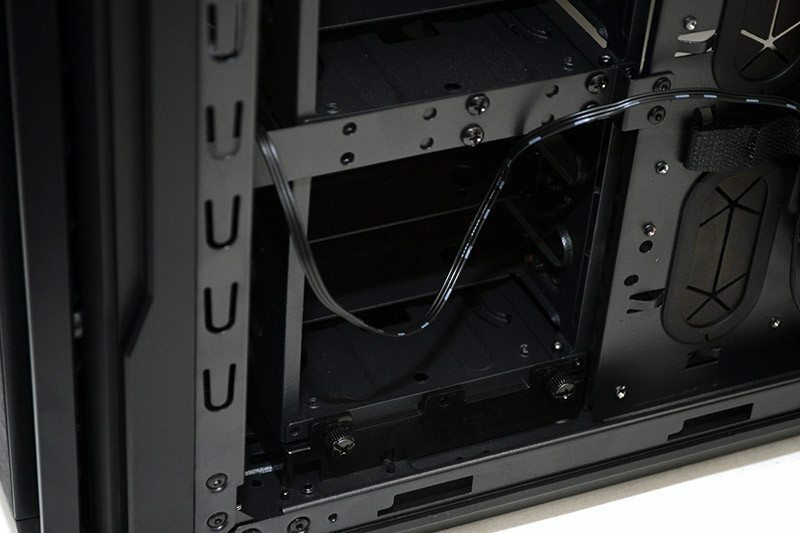 This is also good news for water cooling, as you’ll have room to run tubing and joints beside the cards. 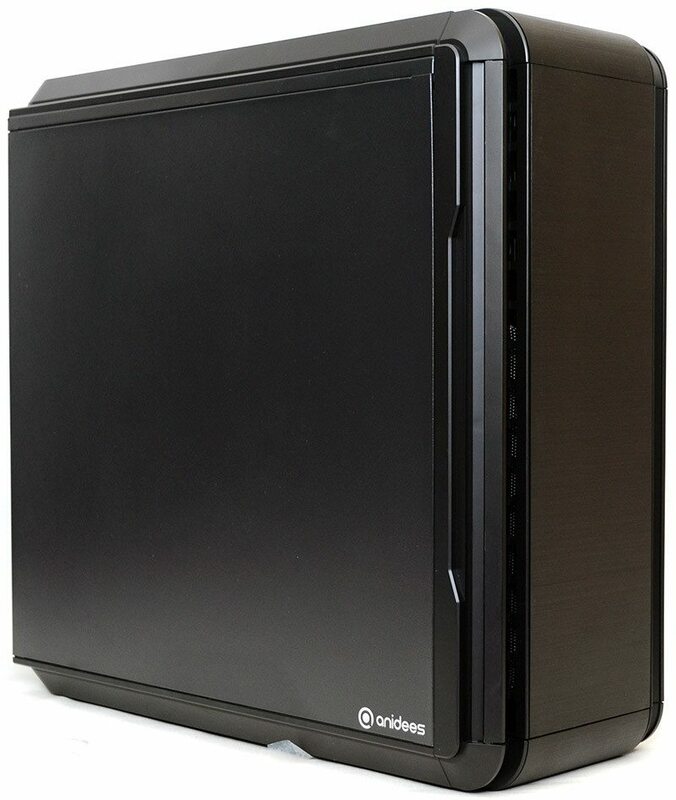 The width also means a good amount of space for a larger air cooler, while those using an AIO will find more than enough room to install thicker radiator designs on the rear mounting. 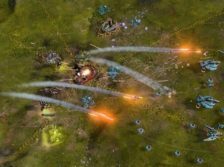 Overall, a neat and tidy build. 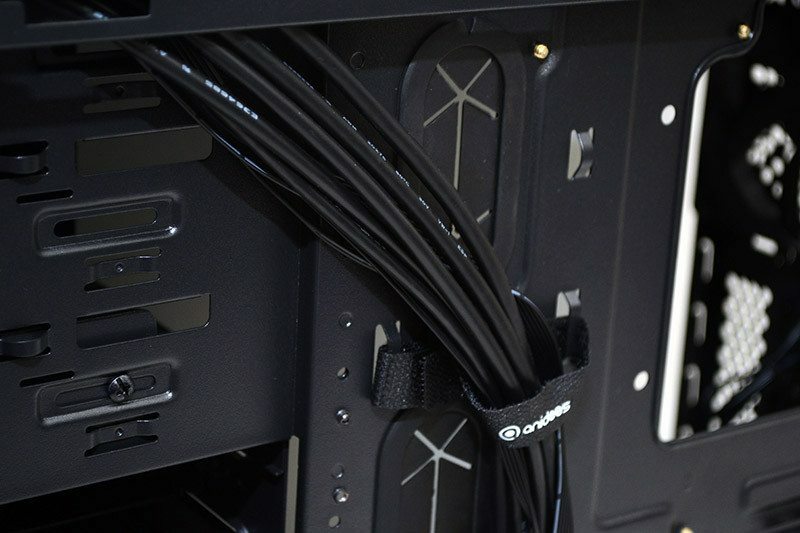 The cable routing holes could be bigger near the PSU and the soft padding on the rear panel makes it harder to slide back on over some cables, but neither of these issues are a deal breaker for us.